Bottesford organised its own Festival of Britain celebrations in 1951. Described by Herbert Morrison as a ‘tonic for the nation’ facing the austerity of post war recovery the local celebrations were organised by Mr. Heath (far left standing behind the microphone), who lived on the High Street at Beechwood House. 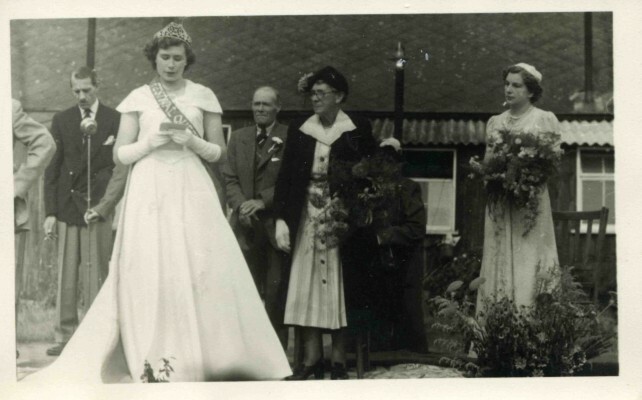 Margaret Waudby recalls that the crowning of Dorothy Calcraft as the Festival Queen in Bottesford was given to the ‘oldest able bodied person in the village’! That honour fell to Mrs. Gale (centre of the photograph). Dorothy Calcraft is shown giving her acceptance speech attended by Margaret Waudby as the Maid of Honour holding her bouquet. Also pictured in centre background is Mr. Gale. We are most grateful to Margaret Waudby for making this photograph available. This page was added on 07/01/2008.